Save the date for our next RELaTED project webinar “New solutions for sustainable district heating in European cities” organised with Covenant of Mayors Office. 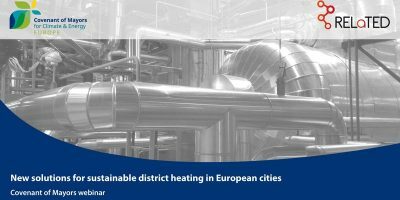 During this webinar you will learn about EU’s heating & cooling decarbonisation policies, discover how the ultra-low temperature district heating concept may contribute to mainstreaming renewable energy in the heating sector and how it is being currently tested in Tartu, Estonia. EU’s heating & cooling decarbonisation policies & support to local/regional authorities. EVA Hoos, DG Energy, European Commission. Presentation of the RELaTED demonstration site in Belgrade, Serbia. Ljubiša Vladić, Beoelektrane.